Chili has always been one of my go to foods when I want to eat a lot without using a lot of Points. It’s heartier than a soup, very filling, and I can eat more than 1 serving without feeling guilty. Plus, it’s insanely healthy, and full of fiber and protein. 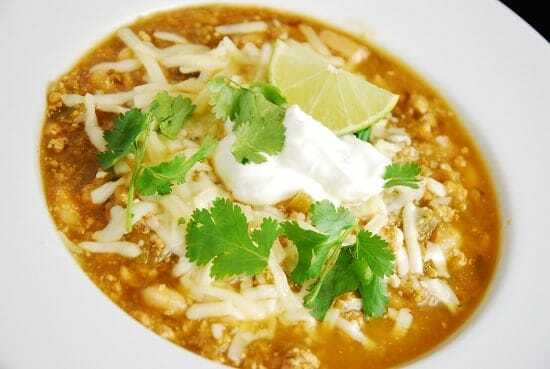 My White Turkey Chili Recipe is the perfect example of what I’m talking about. I even dressed it up with mozzarella cheese and plain, non-fat Greek yogurt, and each serving still camne in at just 5 Points….and it was delicious! The mozzarella gets all melty, and the ground turkey gets nice and moist from stewing a while in the citric acid of the tomatillos. SO GOOD! This can also be made with fresh tomatillos, if you prefer. Either way, it’s a delicious and unique Weight Watchers chili recipe that is sure to fill you up without using many Points. Enjoy! A unique twist on traditional chili recipes, this tasty white chili is immensely satisfying and delicious. Easy to prepare with little preparation and it makes great leftovers, it’s a real bargain at just 5 Points per serving. Of course, it’s also topped with cheese and a healthier alternative to sour cream, for your eating pleasure. Spray a large Dutch oven with non-fat cooking spray and set over medium high heat. Add in onions and garlic, and sauté until tender, about 3-4 minutes. Add in ground took, and cook while breaking up meet, until turkey is browned, about 6-8 minutes. If turkey starts to stick to pot while cooking, add in a bit of the chicken broth as necessary to help de-glaze it from the pot. Add in jalapenos, cumin, coriander, oregano and salt and pepper, and cook until peppers begin to soften, about 3 minutes. Stir in tomatillos, chilies and chicken stock. Bring to a simmer, and then lower to medium-low heat. Cover and let cook for about an hour. Add in cannellini beans and cook for another 30-45 minutes. Serve with a 2 heaping tablespoons of mozzarella cheese, a heaping tablespoon of yogurt, and garnish with cilantro and lime wedges. Omg this has become the most requested dish that I make for my father…he thinks it’s better than traditional chili and we’re from Ohio and are devoted 5-way Cincinnati chili fans. I couldn’t agree more!! This has so much flavor, feels lighter, and keeps getting better with each passing day in the fridge. I can never find canned tomatillos where he lives so I just cool 2 lbs fresh in a little water until they soften and then blend it in a regular blender. Perfect, and zero additives. Thank you for this addition to my family. Made this for dinner tonight it was amazing think you !!!! HUGE HIT! Husband could not believe it was ww’s. So much flavor. Loved the yogurt too – did not miss sour cream one bit. Thank you! I just wanted you to know this is one of my favorite recipes. I have made it many times. I use lower salt broth as it can be a little salty. I have also used fresh tomatillos or substituted some green salsa verde for some of the ingredients when I was in a hurry. Yum. It freezes well also. Do you strain the liquid from the tomatillos before adding?